Globe Telecom ups their live preregistration page for the Samsung Galaxy Note 3 and Samsung Galaxy Gear. 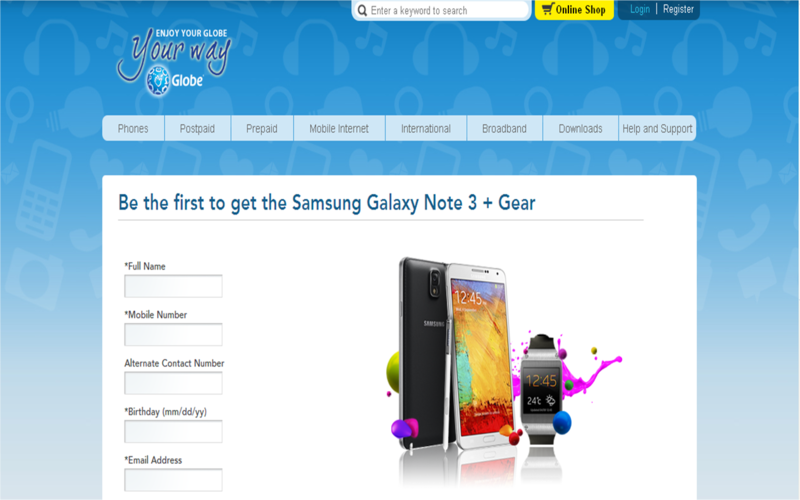 On the background Globe’s website you’ll also notice the darker shade of blue and a sparkling new logo. The pre-registration portal allows interested subscribers to register personal details such as name, mobile number, and e-mail address. The customer database will be used to update subscribers with the device’s features, postpaid plan offers, and pricing details. The Samsung Galaxy Note 3 has a 5.7-inch full HD Super AMOLED display, a 2.3 GHz Quad-Core Processor, Android 4.3 Jelly Bean, 13-megapixel rear auto-focus camera with flash and zero shutter lag and a 2-megapixel front camera, 32GB user memory and is a 4G LTE-capable device. Additional features include the Air Command, Action Memo, Scrapbook, S Finder, Pen Window, Samsung WatchON and ChatON, and S Voice. Meanwhile, the Samsung Galaxy Gear boasts of an 800 MHz single core processor, has a 1.63-inch Super AMOLED display, and 1.9 megapixel auto-focus camera. Additional features include the S Voice, Memographer, Smart Relay, and Voice Memo. It also has a 4GB user memory plus a 512MB RAM. Pre-register for the Samsung Galaxy Note 3 and Gear here.